The Lulo Diamond Project is located in the Republic of Angola, which ranks as the fifth largest producer of diamonds in the world. Angola is also recognised as one of the most prospective countries for new diamond discoveries. Angola is an official signatory of the Kimberley Process Certification Scheme and occupied the position of Chair of the Kimberley Process in 2015. 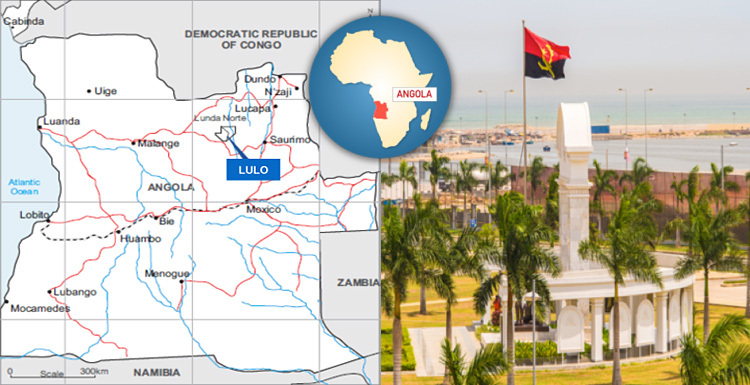 Since being elected in 2017, new Angolan President João Lourenço has made it a top priority to create a new legislative framework to attract more foreign investment in Angola’s diamond sector. The changes being made by President Lourenço include a new diamond marketing policy gazetted in August 2018 allowing diamonds mined in Angola to be sold through an international competitive bid process. Lulo diamonds were the first to be sold under the new marketing policy in January 2019. The legislative changes being advanced by President Lourenço are part of a plan to stimulate direct foreign investment to help increase Angola’s annual diamond production to 14 million carats. Angola’s biggest recorded diamond is the 404 carat 4th February Stone recovered at Lulo in February 2016 and which sold for US$16 million.